If you think your house is clean, you might want to think again! There could be places where dirt, dust, and germs are lurking. 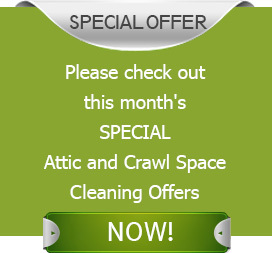 Yes, we are talking about the attic and crawl spaces that are often overlooked. These nooks and crannies may be dark, dingy and uncomfortable, but they are critical components of your house which can tip you off on problems before they get out of control. Identifying the problem is the first step towards a clean, healthy and energy-efficient living space. And what better way to accomplish that than to have periodical inspections of your property. Quartz Solutions is the perfect answer for the monitoring, maintenance and enhancement of your attic and crawl spaces. Ignored and neglected attics and crawl spaces provide a favorable setting for a whole series of problems, ranging from energy loss to breathing unhealthy air. Dripping ducts and damaged insulation not only spreads harmful allergens and triggers poor quality of air but also spikes energy bills. Ghastly mold and mildew rear its ugly head in damp, dusty, and stagnant conditions. A moist environment also leads to structural damage due to rot, corrosion and termite infestation that can adversely impact your wallet. 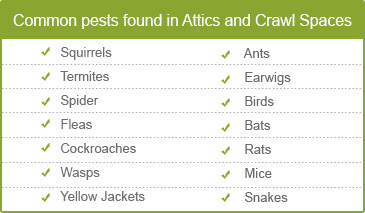 Insects such as wasps, roaches and flies are known to transmit common protozoan infections. Animals like rodents, mice, bats and squirrels can destroy wooden appliances and insulation material, chew cables and wiring. These unwanted intruders often release their foul smelling excrement which can pose serious health hazards to the family. The careful inspection of your property carried out in a methodical manner is imperative to enjoy a healthy living space. Experts from Quartz Solutions will do the needful including testing for Radon- a carcinogenic gas that is hazardous to inhale. The team will drop in at your home or business at no cost and as per your convenience. They will assess the existing and impending problems and formulate a plan to address them without pinching your pocket. We totally understand the value of hard-earned money. Our experts strive to find the best solution at a reasonable price for each and every customer, be it commercial or residential. Union City in Hudson County, NJ was also formerly known as the “Embroidery Capital of the World,” because of the rise of textile mills in the early 20th century. The city, with pedestrian-friendly residential areas and a diverse mix of restaurants, businesses and entertainment is thriving. Quartz Solutions promises to do its bit for this community by helping keep the attic and crawl spaces of the 66,455 odd inhabitants in A-one condition with their latest technology. Call us today at 201-205-2042 for a free inspection and consultation.